I've never considered Scott McNealy - Sun Microsystems CEO to be one of the best CEO's ever, but ... this kinda hits it home for me. 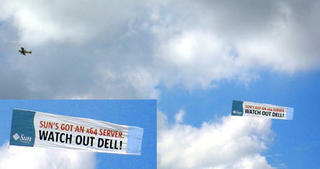 Apparently, Sun's Scott McNealy authorized this plane to fly over Dell headquarters yesterday. 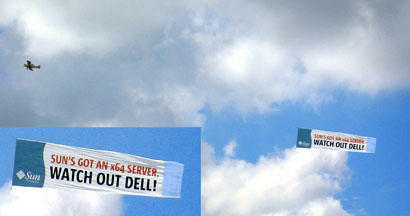 ... Jobs railed against Sun Microsystems as an Evil Empire while at NeXT. Later, after NeXT's hardware division was dropped, Jobs and Sun Microsystems' Scott McNealy introduced OPENSTEP together.